5 Maintenance Tips to extend your Equipment Life. Small, medium and large size machines especially farming equipment requires constant maintenance to keep them in good working condition. Poor handling and maintanance results into poor performance of the equipment, costly breakdown and ungaranteed safety of the operator and persons nearby. Many farms have multiple operators, operating one machine. One of the ongoing inspection on any checklist should be overseeing the correct operation of the equipment at any given time. Farming equipment should be inspected as soon as it is purchased. Operator training is usually and should be done at that particular point, but training should be kept up considering the fact that employees come and go, skills become rusty and poor operations results into breakdown. Machines are provided with operator manuals which should be revised for the specific work situations. A short manual can be provided to each operator for easy reference. 2. Add and Test lubricants frequently. Lubricants reduce friction around any moving parts. Good lubrication in a scheduled time extends the life of any machinery equipment and parts. Lubrication is one of the most important checks for maintenance. Look for any signs of excess oil or grease build up, check for leaks around oil seals etc. Make sure you use the right lubricant, there are specific oil and grease to be used in every equipment and component, check this with the manufacturer. 3.Check for signs of Wear. Wear may result from, vibration, shock, high temperatures and age. All these contributes to breakdown of parts in machines. 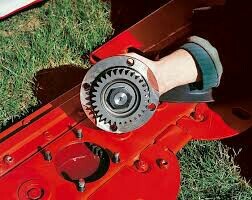 Vibration may result from gears and belts which are out of alignment. Shock can come from accidents and from poor operator techniques. Extended use, friction, poor lubrication, worn out parts etc may cause high temperatures. Age affects many components like seals will dry and crack, bolts will loosen and stretch out of shape etc. Age is a factor to monitor in every equipment. 4. Keep equipment clean and maintain clean Environment. There are many seals and filters in place on agricultural machines to keep working parts clean and free from contamination. Seals ought to be inspected regularly to make sure they are in good condition. Farm machines should be stored in a shed, or other building free from dust, wind and bad weather failure to which it will result to rust and rot. The machine should also be run regularly if it is not in use. 5.Have a maintenance and repair schedule. The cost of regular maintenance is very small when it is compared to the cost of a major breakdown at which time there is no production. The importance of regular maintenance is to ensure that all your equipment is at 100 percent operating efficiency. The operators manual provided with the machine elaborates frequency of maintenance in every part of the machine. Check out on lubrication schedule, parts to be replaced, check tightening of bolts and nuts etc. To conclude, following the above 5 steps, can significantly extend the useful life of your machine, improving the return on investment, improve safety of the operator and any other third party.